I’ve been having some issues with large knitting projects, which means I had to abandon 3 pieces of Christmas knitting. I was knitting for too many hours a day trying to finish two large projects for gifts and ended up with very sore shoulders, elbows and wrists. I knew I wanted to make some ornaments for my family this year, and these Mini Mittens (Ravelry link) which were featured on the cover of the WEBS Holiday 2007 catalog seemed like a great option. They were a delight to knit. I knit eleven pairs, or twenty-two tiny mittens. These are all knitted in scrap quantities of worsted weight yarn (10 yards or so for each pair) and they were easy. Each mitten took 20-30 minutes to knit on size 5 needles. And after big projects? The instant gratification of tiny things is fabulous. 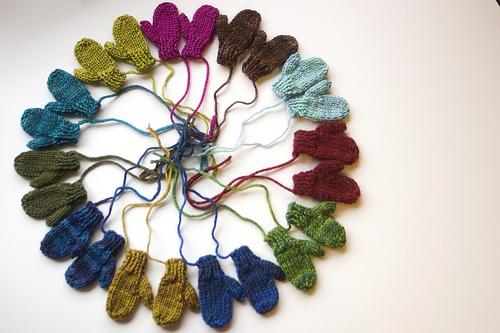 Each mitten is about 2 1/4″ long and about 1″ wide, and they just fill me with glee to look at them all like this. Those are fantastic – how cute! I totally know what you’re talking about when you say they fill you with glee. I haven’t made quite as many as you but here are some that I’ve made too. These are some of the cutest things I’ve seen in a long time! Nice work… and nice photo arrangement!